Start your own reseller service for web hosting service and sell domain names and web hosting services through your own website. INTERCLIX.BIZ offers Professional Grade domain name and hosting service reseller services for selling web hosting service, domain names and much more with your own brand on your reseller website. Sign up now to become a domain name and hosting service reseller and stop giving away your profit. You can start right now! INTERCLIX.BIZ provides a turnkey reseller system and several software tools to sell domain names and hosting services - and more. Use INTERCLIX.BIZ as the foundation for your reseller service get into business as quickly as possible and earn commissions selling these services... complete with your own hosting reseller account and reseller service. 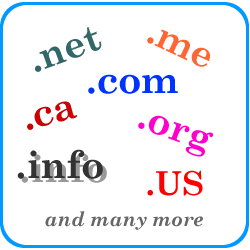 In just a few clicks from now you could be operating your own domain name and hosting business reseller service from INTERCLIX.BIZ . * Certain conditions apply. See Interclix.BIZ for full details.